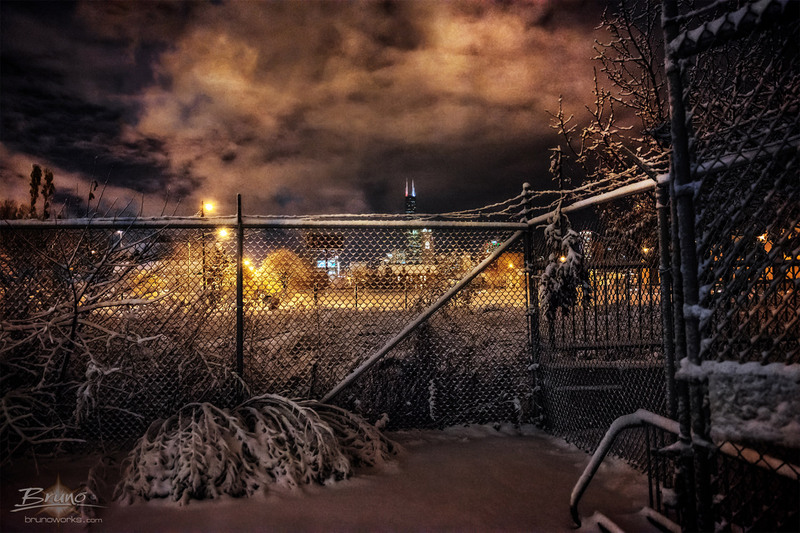 I am an urban dweller and night owl on a mission: Exploring my beautifully gritty and eerie city Chicago with photography and digital art during twilight hours and the night. As a native Swiss-German expatriate, Gotham City, as I call it, never ceases to visually fascinate me. An endless source of serene alleys and bridges, gritty industrial sceneries and majestic cityscapes. Chicago has its very own unique dreamy retro characteristics, especially at night. Right up my (dark) alley, literally. Unfortunately, year after year I see this beautiful city evaporate right in front of my eyes. My goal is to capture as much of its turn of the century glory days as possible before it is all gone. If I’m not photographing in a dark Chicago alley, I spend my free time working on photo-illustrations and surrealistic digital art in my “editing cave”. I’m exploring various subject matters that move me with digital art, trying to express my take on current issues in visual form. From simple composites and double exposures to more complex photo-illustrations. It’s a never-ending journey experimenting with new techniques both behind the camera and in front of my two screens. The more you learn, the less it feels you know. As most photographers and visual artists, I learned the craft back in high school with 35mm film cameras. After a while, I shot for various local and regional newspapers. Transition to digital: I started out in the modern area by teaching myself Aldus Photostyler, a predecessor to Photoshop, back in 1990 and bought my first digital camera in 1992, a Logitech Fotoman. As you can see in my portfolio, I use various degrees of digital processing and manipulation: From basic “dodging and burning” to full-blown surrealistic photo illustrations. During the day, you can find me at Bauwerks Photography Studio in Chicago working as Technical Manager/Photographer, Co-Founder. I hope you’re enjoying my photography site. More works coming up soon, including a series of videos. Sign up to my mailing list (to the right) and come back often to view my photography and digital art blog for updates.